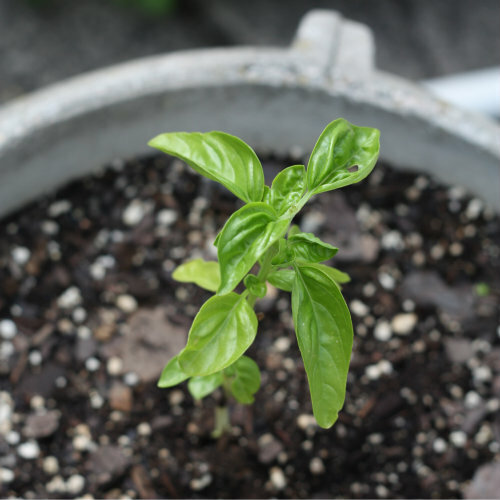 Basil is one of the easiest and fastest plants for propagation and summer is the perfect time to experiment in your own garden. 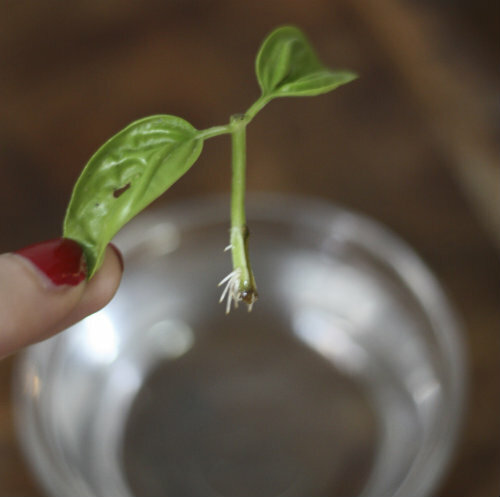 Propagating basil cuttings is a great way to keep your basil supply going strong all season long, and a fun way to create new starter plants that make great hostess or parting gifts for all those summer get togethers. We've been trying it ourselves over the past couple of weeks and are already seeing success! 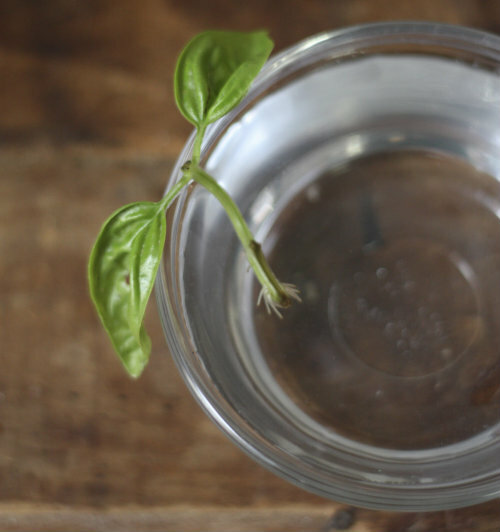 Give the rooted plant that was just cut a good watering so it can start to regenerate itself. 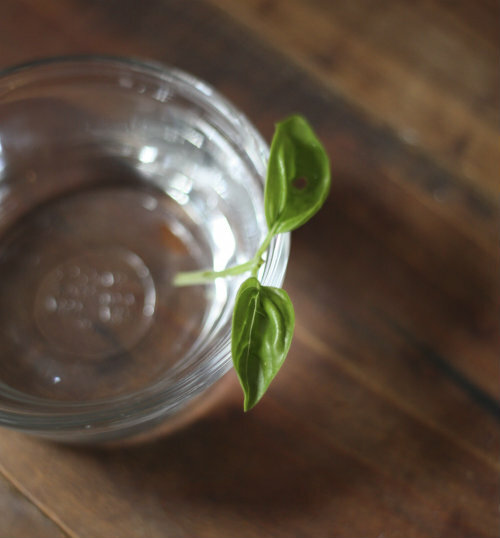 Then place in a dish of fresh water by the windowsill to sit. 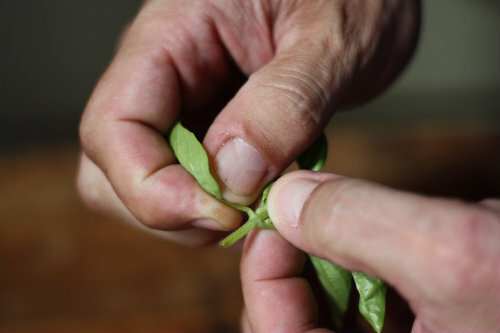 Over the next several days, keep the water in the dish fresh and covering the stem of the cutting. As each of these stems continue to grow longer and stronger, we'll be able to take new cuttings from each. 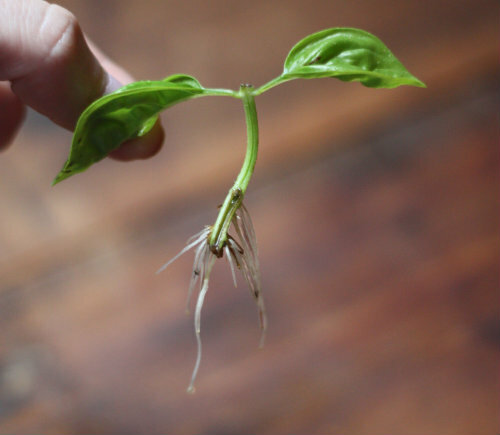 This will allow us to get more basil started, while keeping the mother plant full and bushy instead of tall sparse. 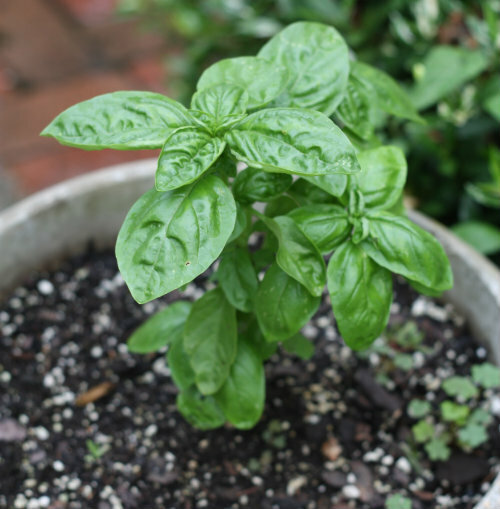 This cycle can go on and on, providing you with lasting basil all season long. We'll keep you posted with how it goes for us. 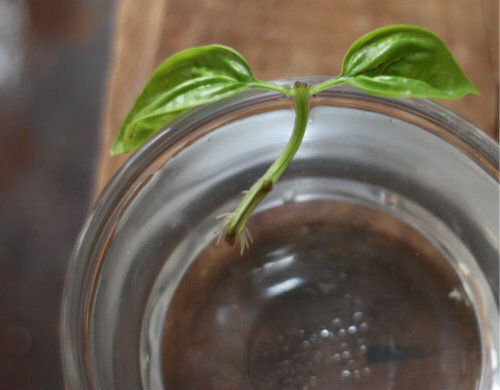 Have you had success regenerating basil or other plants — what methods seem fail proof for you? Loved this post, have been meaning to propagate more basil given that my plant went through a decent beating the past few months! Fingers crossed the little one propagates! I am sure you will do just fine. This really is easy! I tried this b4 following these instructions, but, since I'm in Florida, I think the sun magnified through the window & fried my basil sprout. So, I'm trying it again, but I'm keeping it outside in moderate shade & hoping it'll grow. Oh my goodness! You just saved my plant! We are newbies at growing our own food and this was perfect!! Hey! I am kinda desperate with my basil and no one here knows a thing about it. If I sent pictures of mine to you could you help me with them? Hey! I am having some trouble with my basil, and no one here knows a thing about it. I know you already give tips about it, but if I send pictures of mine, would you help me? Will risk and try your advice now. You can do the same thing with mint and rosemary and I think tomato. I am current testing the tomato. I want to learn all the plants that can be cloned like this. Mint will multiply on its own....stems will spread on the ground and root. Just cut off that part and you will have a new plant. Mints are best kept confined in a pot or corner as they spread so fast that they will take over everything before you know it !!!! You all are great! Seriously. Basil is my favorite. Thanks for the tips. 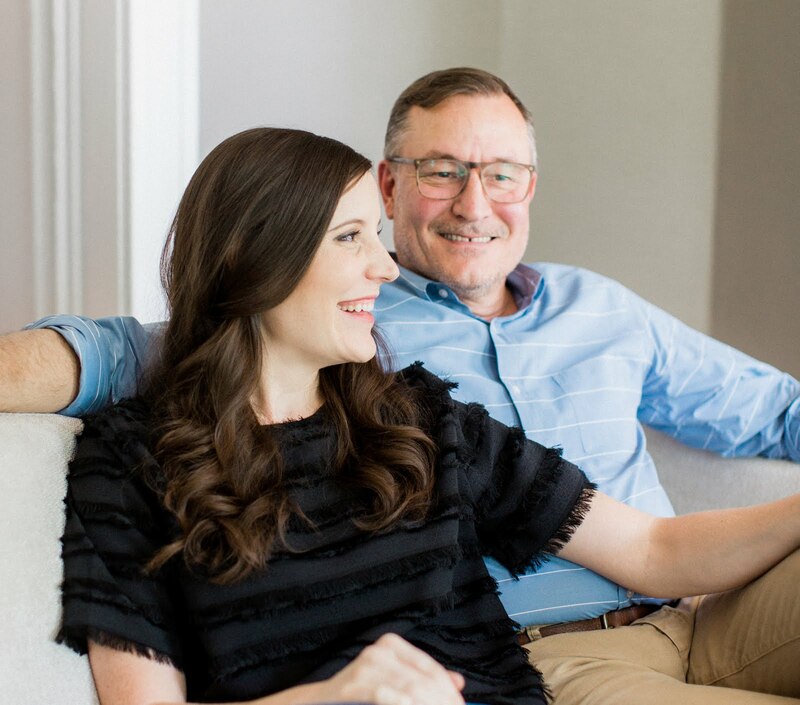 We are happy you found us! Please stay in touch. Does this concept of a bushy plant applies to mints as well? Or other herbs? For the most part yes it does! Good luck! I am a newbie at growing my own food. I really thank you for this. I helps me out a lot with my basil plant. If i take a cut from my rosemary, parsley, and mint and do the same thing you did here will i get the same results from the these other herb plants as well? Thanks so much for giving it a try and yes those will work. If you go to the bottom of this post you will see a link for rosemary mint and other herbs we have been successful with! Happy growing! What is that link as I do not see it? Great! 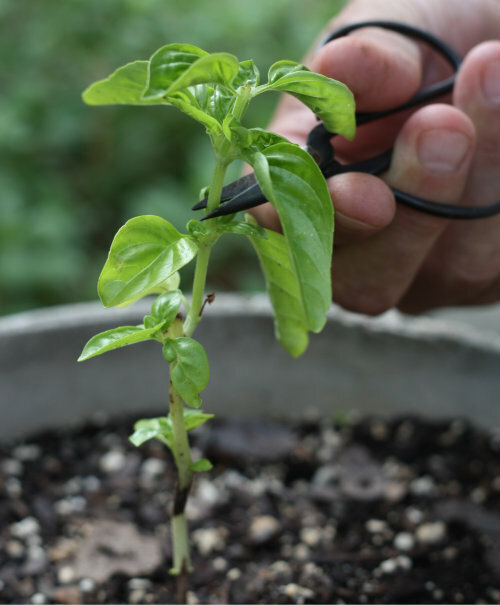 I have two extremely tall, sparse and leggy basil plants that aren't producing much foliage, so with these tips I should be able to lop the tops off and start anew. Will keep on top of the pruning this time to get bushier plants! great! 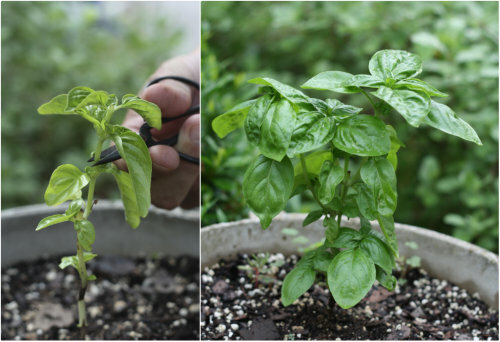 I have two extremely tall, sparse basil plants with few branches that are struggling to produce enough foliage- with these tips I should be able to lop the tops off and give them a second chance. Perhaps I'll keep on top of the pruning this time round! Thanks a million for this valuable post. Your skills saved my Basil. Yes, thank you for this post! After leaving my clippings in water for a week and a half or so mine have grown a lot of roots! I've just planted two clippings in soil, how much/often do you suggest I water it? Does anyone have any ideas on how we could keep these new "startings" to last through the the fall and possibly winter? Grow lights? Somehow I have started numerous basil plants but never tried it this way. I have noticed small ones coming up in the ground around the grown plants. Just wondering if the flowers at the top fall of and basil grows from them? I have done nothing and then see these growing in the rocks. 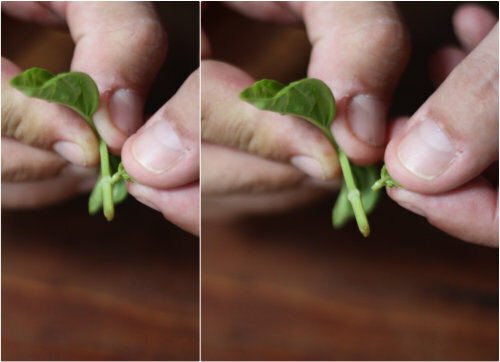 9 times out of 10 the cut stem turns brown instead of forming roots. Then the remaining leaves just shrivel up and dry. :( Very difficult to get them to the potting stage and then if you do they still die off. @Sindi Stack, I share the same sentiment. I wonder what I did wrong? I replaced the water every day.